Heated pressure washer units are special washers that go an extra mile than most pressure washers which are cold water based. Heated washers are essentially hot water pressure washers. They have the ability to heat up the high pressure water that is released by the washer. As a result of this function they come naturally bulky. More bulky than standard cold water washers. 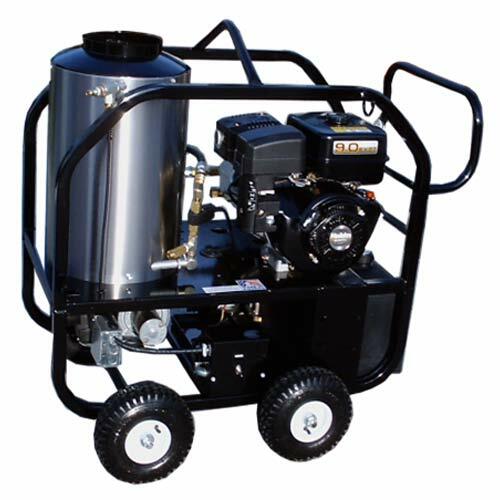 Hot water pressure washers are used to power clean the toughest of jobs which are usually very difficult to accomplish only with a high pressure cold water washer. This includes the removal of tough graffiti, tough oil and grease stains on heavy duty machinery and equipment. Heated pressure washer units are also very handy in kitchen environments were there is a lot of grease. Due to the gas fumes produced by these washers it is usually the hose that is brought inside to clean whilst the machine itself remains outdoors. Most heated washers are gas powered pressure washers However, there is also a fair share of models which are electric powered some of which are reviewed below. It is also possible for a heated washer to use detergents in the cleaning process which can be introduced into the high pressure hot water. 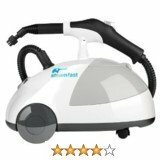 The following are our best pick pressure washer models that we consider worth looking at as you research on heated washers. You may also look at our other review page under hot water washers for more models to consider. Manufactured by Mi-T-M this professional heated washer has output power of 2000psi. It has a water flow of 2.8 GPM. This is one of the electric hot water pressure washers and is therefore suitable for indoor use. For example, some buyers have purchased this unit for use in warehouses. It can also do kitchens for hotels and restaurants apart from being used in doing thorough cleaning and sanitization of toilets and ablutions in general. This washer heats up water to a temperature as high as 200 degrees F (nearly 100 degrees Celsius). It is an easy maintenance heated washer designed to last longer. It is therefore most suitable as a commercial or professional washer which has a quick return on investment. Even though it can be used around the home the price of the unit at $2500.00 is usually prohibitive for most home owners. We recommend this washer as a very good buy and investment for your business or professional set-up. It is available online mostly through PWD. 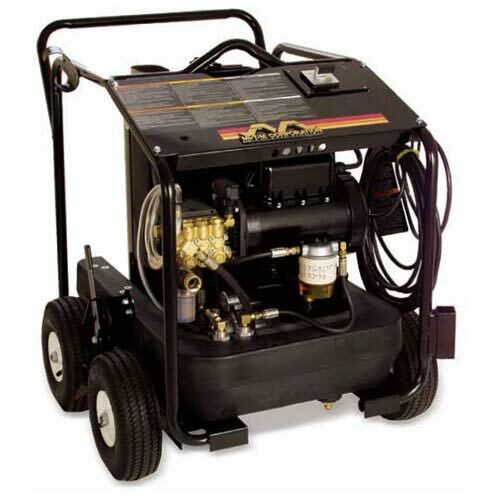 This washer is a professional gas powered hot water pressure washer with output power of 2500psi. This is higher than the Mi-T-M HSE-2003-0M10 reviewed above which is electric powered. In many cases gas powered washers have a higher pressure output than those powered by electric power. This unit is also designed for commercial and professional jobs and is priced at nearly $3000.00. It's burner has the capability of raising your water temperature by an additional 120 degrees F. This means your water temperature fed into the burner can further be increased by another 120 degrees. It runs on an Subaru engine which is also a reputable engine type. In order to access all your work environments this washer is mounted on a four wheeled frame making it easy to move from one work area to the another. This washer also comes with a total of five nozzles of 0, 15, 25 and 40 degrees as well as a detergent nozzle. Users praise the long hose of 50ft which is also non-marking. This is important when working on certain surfaces were a poorly made hose may leave bad tainting rubber marks on surfaces such as driveways, walkways or even concrete. Follow link to read some more reviews of other models of hot water pressure washers that we have done on this site. Simpson pressure washers are amongst highly respected washers on the market when considering heavy duty professional washers. 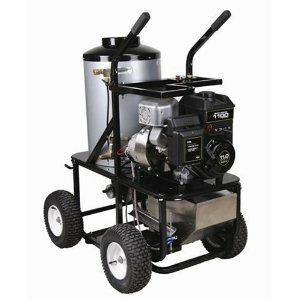 This 3000psi and 3.0GPM washer from Simpson falls into the King Brute series and is a gas powered heated pressure washer. It is powered by a Briggs and Stratton engine which is however not our favorite and best recommended engine. The best rated washer engine and pump on the market today is Honda and CAT respectively. This combination is considered a winning combination. In this case, the good news is that this King Brute KB3030 has a CAT 3DNX commercial series pump. The particular problem associated with Briggs engines is the general difficulty users sometimes complain of to do with starting them. Honda engines are known to start on first pull. Briggs can take 2 or three pulls. 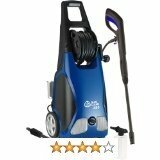 This is a very powerful heated pressure washer that will do your cleaning jobs in less time and very effectively. In terms of maximum temperature expect this washer to heat up your incoming water another 100 degrees F.